There were a total of 114 readings submitted with 70 readings being better than 100 millihertz. If this trend keeps going I will soon be able to drop the better than 100 millhertz box, every one will be in it! I'm sure Mr. Doppler still has plenty of tricks left in his bag to keep us scratching our heads for a while. This is indeed a challenge. Congratulations guys!!! All readings continue to improve. There were 70 readings 100 millihertz or better. Very impressive. K1GGI EMA Another fun time. 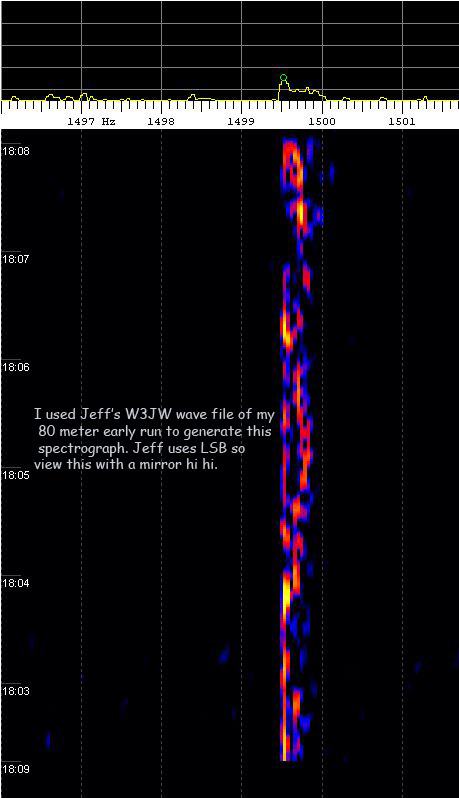 20m east and west were a lot closer than other times, .02Hz. Nil on 80 early and 17 west. Lost W6OQI to qsb soon after the beginning. K5BTK MS Just like last month, 40m BOOMED in and all other tests were between very weak and extremely weak. A faint "pip" appeared on my waterfall for the 30m test for about 10 secs at 21:36:52 UTC in my S7 line-noise. But I was determined to get a measurement on all frequencies. Your web site made me aware of Spectrum Lab which I used this time rather than Digipan. Thanks for the fun! K5CM OK Good signal tonight with some QRN from nearby storms. Marvin, thanks for the West coast run. KD2BD NNJ Nothing heard on the early 80-meter run, but the late run provided *VERY* strong signals into NJ with minimal fading. 160-meter signals were noticeably weaker with some deep fades. W6OQI was weaker still, but strong enough to make measurements. The 80-meter readings were taken using a loop filter with insufficient damping. Hopefully no oscillations occurred during test time. The Kp index was 4. N5LBZ MS No copy on 17 and the early 80M test again. Into every life a little rain must fall and Friday nite/early Sat we got 51/2 inches with thunderstorms. Unfortunately, I did not realize the storm blew the fuse in mu GPS until I had completed all my readings. So I had to do them all over. I wont be surprised if I messed the mark on all bands. W0PHD MN 17M all most no copy 20 M QSB to noise floor 80 M late qrm was one of the most difficult FMTs for me as lots of Doppler on all signals here. W1PW AZ 17M:East run inaudible. West run S2 up to S6. 20M:East run S9; West run S9+15; 30M:S2 (max) with deep qsb into the noise; 40M: S6; 80M (early) was inaudible; 80M (late) S4-S5 with LOTS of Doppler; 160M: S6 with Doppler, but less than was on 80M (Late). Thanks Connie and Marvin for these tests. W5UFZ AZ 5-6-9 to 5-9-9 all bands except 80 meter early run where there was no sig here at all. K5CM late 80 meter too much qrm to get reading. My gps freq standard died halfway thru FMT. Great fun, hi! Tnx for the test. W6OQI LAX No signal heard on 17 meters. 20 meter signal was very strong. 30 meter signal was weak but OK for measurement. 40 meters was also weak but OK for measurement. Nothing heard on the early 80 meter run. Signal was good for the late 80 meter run. 160 signal was good. W9TJ IL No signals 17 or 30 mtrs. 20 east weak QSB some QRM, west more stable. 40 FB sig no fade phase stable. 80 early FB sig and stable. 80 late FB signal but wild phase deviation. 160 good signal but phase wander. W6OQI QRN @ S8, sig weak and phase unstable. WB9FIP WI Another great FMT! 17 meters is getting tougher --- could only make a visual on waterfall display. Marvin was a nice S7 on 80 tonight. Thanks to all for the fun. Even though Jeff was barely able to copy my call in the 80 meter early run, he managed a very good reading with SL. A HP-Z3801 GPS clocks a HP-3336B. A 10 db transistor amp follows and drives a 12BY7 / pair 6146. Then to the final amplifier, a Dentron 2500 running 400 watts on 160m, 225 watts on 80m, 275 watts on 40m, 125 watts on 30m, 325 watts on 20m and 125 watts on 17m. There are no mixers or any device in the chain of amplifiers that might impact the accuracy of the HP-Z3801. As a reality check, I periodically log the HP-Z3801 against WWVB. I monitor each transmission with a completely separate receive system to look for any instability or short term drift. The separate system is not locked to the GPS but calibrated by the GPS system before the FMT.